Late 1993 Wood and clay buck for first interior design studies also indicated possible knock-on chassis design elements. 14.2.1994 Peter Bullivant Clarke of Hydro visits Lotus, detailed commercial discussions begin. 3.1994 Bonding rather than welding or riveting, as chassis element joining method is preferred by engineering before a partner is found. 4.1994 Hugh Kemp and Daryl Greig visit Hydro in Denmark. 5.1995 Testing of bonded joints begins by Lotus and three consultants. 21.6.1994 M111 project name officially adopted. Also, two wooden bucks created - one for design to study interiors and the second to establish main component layout (engine etc) for engineering. 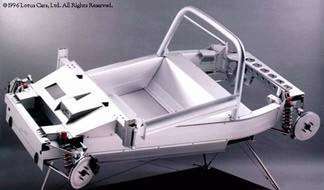 28.7.1994 Anticipated 10,000 lb ft torsional strength with chassis weight 60-70kg. Both targets met with a production weight of 68kg. All major body elements - clamshell panels as well as chassis, now drawn and circulated. 9.1994 All minor areas of chassis also fully drawn and detailed for first chassis. 25.10.1994 "Gadget Building" at Millbrook houses structural bonding tests adhesives, extruded aluminium joints and rivets. Standard 325',Joules impact test from 15.7kg dropped over 2 metres. 22.12.1994 Tony Shute and Richard Rackham take first laps in prototype (PI) chassis without body at Hethel track from 22.10 pm hours. 2 laps shake down and then in with a water hose leak. Weighed 550kg as a skeletal runner with windscreen. 19.1.1995 PI ran from this date and completed 100 laps of Millbrook Pave completed "without problems". Millbrook also began conducting accelerated corrosion durability testing in this period. 11.2.1995 Completed Pave tests totaling 1820kms/1130 miles. Chassis measured and re-measured for deterioration, none detected!